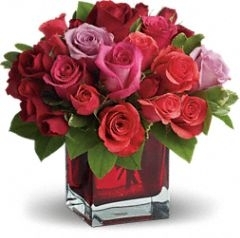 Roses in passionate shades of red, pink and purple express love and devotion to that special someone. Dense and dramatic, the classic blooms look especially chic in our modern red cube vase. •Presented in a radiant red cube vase. 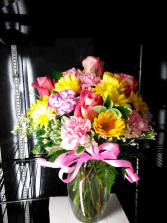 •Approximately 11" W x 10" H. •This item is hand-arranged and delivered by A Royal Bloom florist. 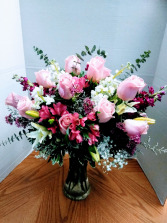 Soft pink, rose arrangement, consisting of soft pink roses, hot pink stock, white stock, white lilies and other accent flowers. 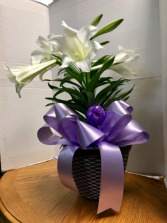 Potted Easter Lily plant with bow and glass egg accessory.